We manufacture, distribute and sell Poly Storage Tanks. 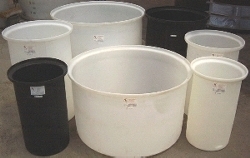 HDPE Polyethylene tanks, Polypropylene tanks and PVDF (Kynar) tanks are availalble. Any of these tanks can be Heat Traced and Insulated. We have Single Wall Tanks and Double Wall Tanks. Many of our HDPE Polyethylene tanks are available in your choice of several colors. Explore our site and our selection of tanks. 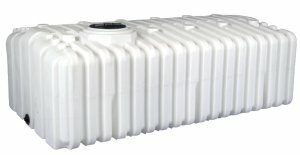 Vertical Tanks are usually the most cost efficient plastic storage tanks. 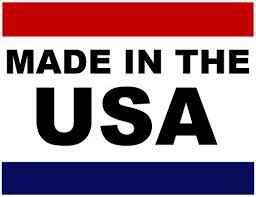 Most vertical tanks are manufactured to comply with an ASTM standard. The shape of the tank requires less resin and normally costs less per gallon of storage. 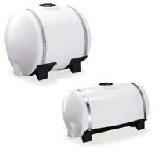 Horizontal Leg Tanks are useful when you need a low profile or when the tank is to be mounted on a truck or trailer. These tanks are mounted on trucks and trailers and used to transfer water from place to place. 'Water Only' vertical tanks have thinner walls than other plastic storage tanks since these tanks do not have to hold heavy chemicals. Thinner walls mean less resin and lower prices. Water tanks also have opaque walls to block UV rays that promote the growth of algae. Rectangular Tanks are normally smaller tanks that need to fit into a small space. They are often mounted on or with machinery. Open top tanks are usually used for mixing liquids . Easy access to the stored liquid is important. Loose fit lids are available. 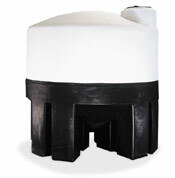 Cone bottom tanks are useful when you need complete drainage of the liquid in the tank. This may be especially useful when mixing batches of a chemical or other liquid. Cone bottom tanks up to 3000 gallons may have molde plastic stands. 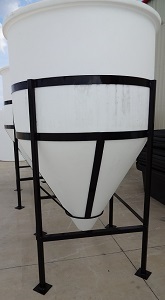 Open Top Cone Bottom tanks combine total drainage with ease of access for mixing. Loose fit lids are available. 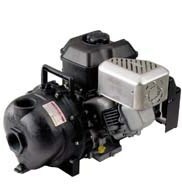 Applicator tanks are often mounted on trucks or trailers and combined with pumps and sprayers. 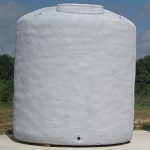 Our insulated tanks have a 2" layer of closed-cell polyurethane foam. That foam is covered with a white mastic sealant. These tanks are often equipped with 'Heat Tracing' which maintains the stored liquid above a specified minimum temperature. PCO tanks are similar to rectangular tanks and are often used in the back of pickups.